In cellular metabolism, lipid peroxidation is a well-defined mechanism of cellular damage in both animals and plants as fatty acids undergo a chemical reaction with oxygen to produce energy. In other words Reactive Nitrogen Species(RNS) and Reactive Oxygen Species(ROS) such as: superoxide, hydroxyl radical, hydrogen peroxide and other free radicals, which are all natural by-product of normal cell metabolism of oxygen, and enzymatic activity of inducible nitric oxide often compromise the integrity of the cell membrane. Radicals (often referred to as free radicals) is an atom or a group of atoms with at least one unpaired electron. The unpaired electrons cause radicals to be highly chemically reactive. In the body it is usually an oxygen molecule that has lost an electron, and the only way to stabilize itself is to steal an electron from a nearby molecule. 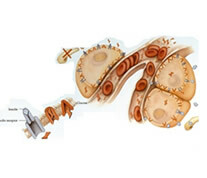 ROS and RNS radicals have important roles in cell signalling and homoeostasis that offset disrupting changes in the body. However, if one does not take in adequate nutrition such as antioxidants, free radical levels can increase dramatically and become cytotoxic (toxic to cells) and alter normal cell activity, especial during times of stress. 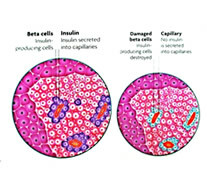 The overwhelming and continuous onslaught from free radicals is what destroy the beta cells that produces the hormone insulin in the isles of Langerhans in the pancreas.